Since 2010, Primetime has been one of the premiere party bands in Connecticut. 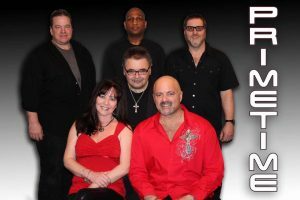 This six-piece band has played all over the state in some the most go-to venues like the Mohegan Sun Wolf Den, Captain’s Cove in Bridgeport and many of the top bars and restaurants. Originally formed by brothers Ralph and Sal Valente with Paul Puglisi and Friday Solomon, the band has now added vocalist Linda Adams and guitarist Dean Crandley to complete the group that guarantees to keep you on the dance floor from the opening song to last call. Primetime plays iconic music from the top bands of the pop music era. They don’t shy any from any genres either as they play music from bands and artists such as Earth, Wind and Fire, KC and the Sunshine Band, Journey, Maroon 5, Bruno Mars, Big and Rich and much more.